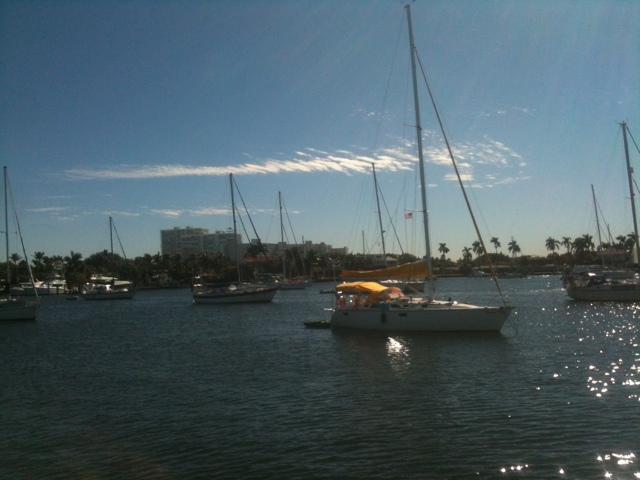 We have stayed last night and tonight in the yachting capitol, Fort Lauderdale. We got here late last night and anchored in the dark next to 19 other boats. 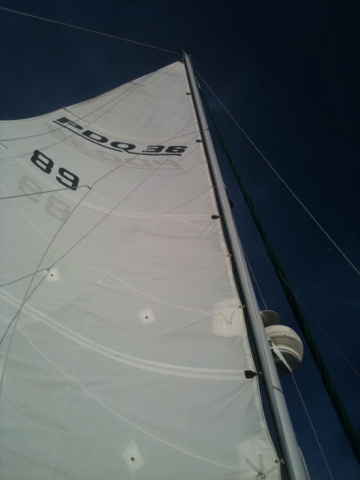 Spent a restless night with high winds afraid we would drag into another boat. A cold front moved in Friday and we have had high northern winds the last 2 days. It was chilly last night and this morning with the low of 41 degrees. The warm pressure is building and should head off the northern winds in the next couple days and this is when we will make our passage northeast to the Bahamas. Today was spent waking up early to move the anchor then back to bed to sleep in. We worked on the electrical system trying to get the batteries to stay charged through the night only running the anchor light and refrigerator. We will find out around 4:30am if they stay charged. I did some laundry today and then found out we could get a ticket for hanging our laundry out to dry. Lucy is now using the potty patch 50% of the time. Preston got the fishing rod mount attached to our back rail and Dan got our dink motor put back together. Oh yeah while Preston was dropping me off at the car the dink engine died. We ended up working on it for 2 hours then bought an 1988 9.5 hp from the guy helping us work on ours. So now we have 2 dink motors. 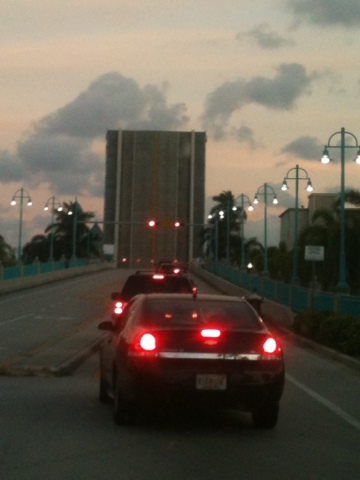 The last picture is me waiting in traffic while the bridge is opened for one lone catamaran with my dogs and boys on it. I hope you haven't lost Wilson yet! It looks like you've found your "Home" you are all sailors for sure!! Miss you guys! Two motors means twice the trouble! Its not too late to ask Santa for one good one(: I hope you hit smooth water and gentle breezes as I believe in karma AND you guys are surely due. Christmas in the Bahama's, may the winds be kind and the seas gentle. Hi to the 5 of you, and officially Merry Christmas. Joe and I are still up getting the last things ready for the big day. Our main effort is for the Grandchildren. We have some gifts for you, and we will keep them here for you until the time when you can be back with us. We are so excited every day to see your post. The pictures are great, and the dialogue is professional. I am so impressed by your writing. You should keep lots of notes and write a book about your experiences. Tara, did you take journalism classes, or did your writing skill just come naturally? We love and miss you all.